The Christmas tree may have German roots, but the twinkling lights adorning them each December are distinctly American. From Thomas Edison's ingenious marketing strategy to Carson Williams' viral "Wizards of Winter" display, here are some facts about fairy lights to keep you warm throughout the season. 1. 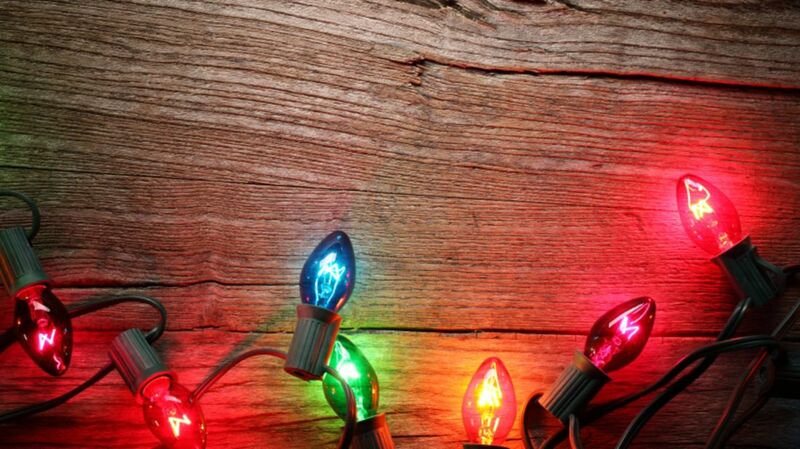 THOMAS EDISON WAS RESPONSIBLE FOR THE FIRST CHRISTMAS LIGHT DISPLAY. Determined to make good on his promise to electrify downtown Manhattan, Thomas Edison sought to draw attention to his incandescent light bulb during the 1880 Christmas season. The Wizard of Menlo Park, who was known for his PR savvy, laid eight miles of underground wire to power strings of lights around the outside of his New Jersey laboratory. Train commuters traveling between New York and Philadelphia were so amazed by the glowing fields that one reporter labeled Edison "the Enchanter" and described the spectacle as "a fairy-land of lights." Just two years later in 1882, Edison set up a central power plant on Pearl Street in Manhattan. That holiday season, his friend and colleague Edward Johnson decorated the first Christmas tree with 80 blinking red, white, and blue electric lights. To add to the historic presentation, Johnson’s tree sat atop a revolving box that spun every 10 seconds. Documenting the amazing display, a reporter from the Detroit Post and Tribune wrote, "I need not tell you that the scintillating evergreen was a pretty sight—one can hardly imagine anything prettier … The tree was kept revolving by a little hidden crank below the floor which was turned by electricity. It was a superb exhibition." 2. GROVER CLEVELAND WAS THE FIRST PRESIDENT TO HAVE A CHRISTMAS TREE DECKED OUT IN ELECTRIC BULBS. Benjamin Harrison was the first to have a Christmas tree in the White House in 1889, but it wasn’t until 1895—four years after the White House was wired with electricity—that Grover Cleveland requested the first family’s tree be adorned with hundreds of multi-colored bulbs. The 24th president is credited with warming the public to the idea of electric Christmas lights. At the time, many people mistrusted electricity and thought that dangerous vapors would seep into their homes through the lights and wires. By 1900, it could cost as much as $300 (around $2000 today) to pay for the lights, a generator, and a wireman’s services to illuminate a Christmas tree with electric lights. A breakthrough came in 1903 when General Electric (created after another company merged with Edison’s factory) offered the first pre-wired, eight-socket strings of lights. When GE attempted to patent their Christmas “festoons,” their patent application was refused because the product was based on knowledge that ordinary electricians possessed. Once the market was open, other companies and inventors began to produce their own tree light sets, and the American Christmas light industry was born. 4. A 15-YEAR-OLD HELPED MAKE THEM POPULAR. Inspired by a tragic fire that was started by candles decorating a Christmas tree, then-teenager Albert Sadacca suggested adapting the novelty lighting his parents sold for Christmas trees. While only a hundred strings sold in the first year, once Sadacca thought to paint the bulbs red, green, and other colors, the business took off. Sadacca started the National Outfit Manufacturers Association, a trade group of several small companies that consolidated into the NOMA Electric Company in 1926. NOMA became the largest Christmas light company in the world until the mid-1960s. 5. EARLY LIGHTS WERE ELABORATE. 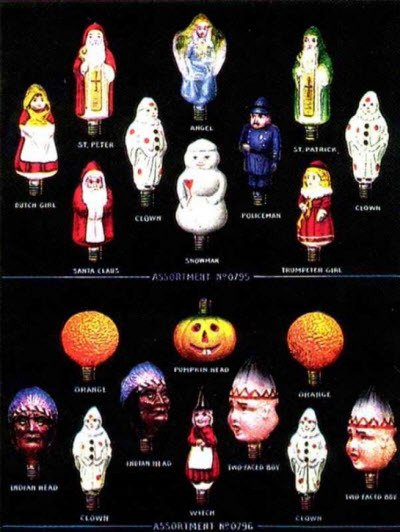 Many of the early figural light bulbs were blown from the molds that were also used to make glass ornaments, and were then painted by toy makers. The paint would often flake from the constant expansion and contraction of the glass (due to the heat generated as a byproduct of making light), so milk glass was typically used to make the flaking paint less noticeable. 6. LIGHTS WEREN'T SAFE FOR OUTDOOR USE UNTIL THE 1920s. President Calvin Coolidge was responsible for the first National Christmas tree in 1923. The 48-foot tall balsam fir came from Coolidge’s home state of Vermont and was adorned with 2500 red, white, and green electric bulbs. But for most of the country, outdoor lights wouldn’t be widely available until 1927. To increase sales, General Electric and various distribution companies sponsored neighborhood “decorating with color-light” contests, a tradition that continues today. 7. THE WORLD RECORD FOR "MOST LIGHTS ON A RESIDENTIAL PROPERTY" BELONGS TO A FAMILY IN NEW YORK. Move over, Clark Griswold. The Gay family strung 601,736 lights around their LaGrangeville, New York home last year to reclaim the Guinness World Record for the most lights on a residential property. Set to more than 200 songs, the installation took the 2014 crown with help from RITZ Crackers, who contributed a 200,000-light display. 8. A MAN IN CANBERRA, AUSTRALIA, HOLDS THE RECORD FOR "MOST LIGHTS ON AN ARTIFICIAL TREE." Fittingly known around town as the “Christmas Lights Man,” David Richards was awarded the Guinness World Record for the world’s largest display of Christmas lights on an artificial tree on November 27. The tree, located in Canberra, Australia’s city center, is made up of 518,838 individual lights, smashing Universal Studios Japan’s October 2015 record of 374,280 lights. Richards is no stranger to impressive illumination displays. He also held the Guinness World Record title for the “largest image made of LED lights” and held the 2013 title for most lights on a residential property. The barrister and his wife Janean use their elaborate displays to raise money for local charities SIDS and Kids ACT, which provided support when they lost their baby in 2002. 9. THE TRANS-SIBERIAN ORCHESTRA CAN THANK AN OHIO ELECTRICAL ENGINEER FOR MAKING THEIR CHRISTMAS TUNES HOLIDAY STAPLES. 10. BLINKING LIGHTS RELY ON A SIMPLE THERMOSTAT. Those red-tipped mini lights that enable a string to twinkle work through a simple design. When electricity heats a strip of metal in the bulb, it bends and breaks the circuit. As the metal cools, it bends back and reconnects the circuit to create an intermittent flashing effect. But more modern light displays use an integrated circuit. Residents of Aurora, Illinois face a fine of $50 if they do not take their lights down by February 25. 12. … WHILE OTHERS BAN CERTAIN KINDS OF LIGHTS. Several homeowners associations across the country ban outdoor light displays, with one in Washington making news for threatening to sue a resident for an overly elaborate display. 13. HANGING OUTDOOR LIGHTS (AND OTHER DECORATIONS) CAN BE DANGEROUS. According to the Consumer Product Safety Commission (CPSC), an estimated 13,000 people were treated in emergency rooms around the country for injuries connected to holiday lights, Christmas trees, ornaments, and other decorations last year. The most common injuries are falls, lacerations, and back strains. 14. FIRES ARE STILL A RISK. While electric lights greatly reduced the risk of fire, the CPSC estimates that between the years of 2009 and 2011, fire departments responded to an average of 200 fires in which the Christmas tree was found to be the first item ignited. These incidents resulted in 10 deaths, 20 injuries, and $16 million in property loss. To prevent fires, make sure to water trees frequently, unplug lights when leaving home, and discard holiday light sets with damage such as exposed wires and broken sockets. 15. THEY GET RECYCLED IN CHINA. Every year, over 20 million pounds of discarded holiday lights arrive in Shijiao, China (near Guangzhou), the Christmas tree light recycling capital of the world. There, bales of Christmas lights are pulverized, separated into brass, cooper, and plastic, and ultimately turned into everything from slippers to new gadgets.